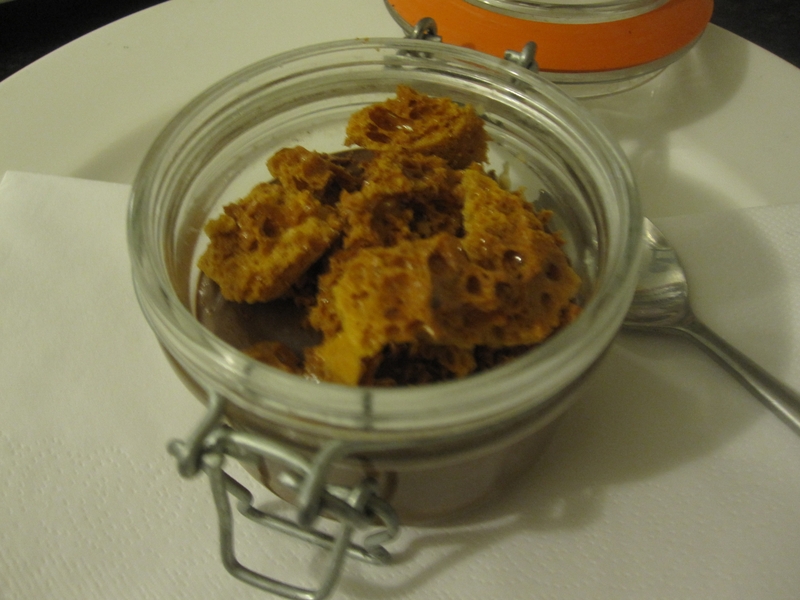 For our dessert at our supper we served a chocolate mouse with salted caramel (the bottom layer) topped with honeycomb… served in (not so little) jars. 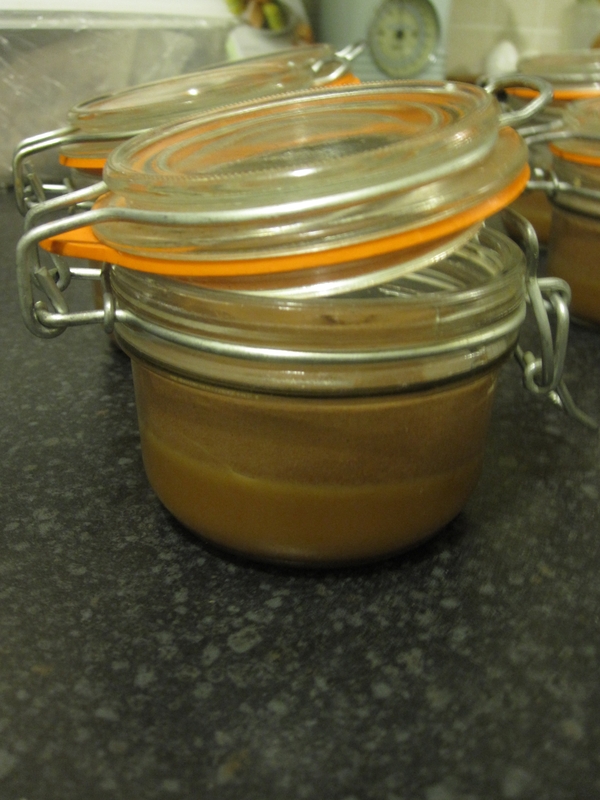 And so I thought I would share the honeycomb recipe, as it is oh so very easy! This will make a small amount, you can multiple if you like. 1. 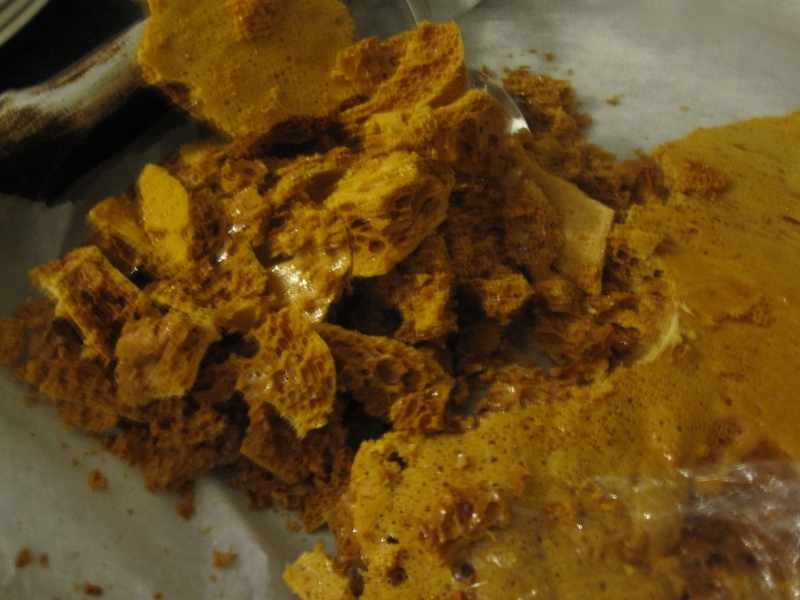 To make the honeycomb, heat the sugar and syrup gently in a heavy saucepan until the sugar melts, then boil the mixture until it turns a deep, golden caramel. 2. Whisk in the bicarbonate of soda (this will make it foam up) then quickly pour it onto an oiled baking sheet, set on a chopping board, and cool. 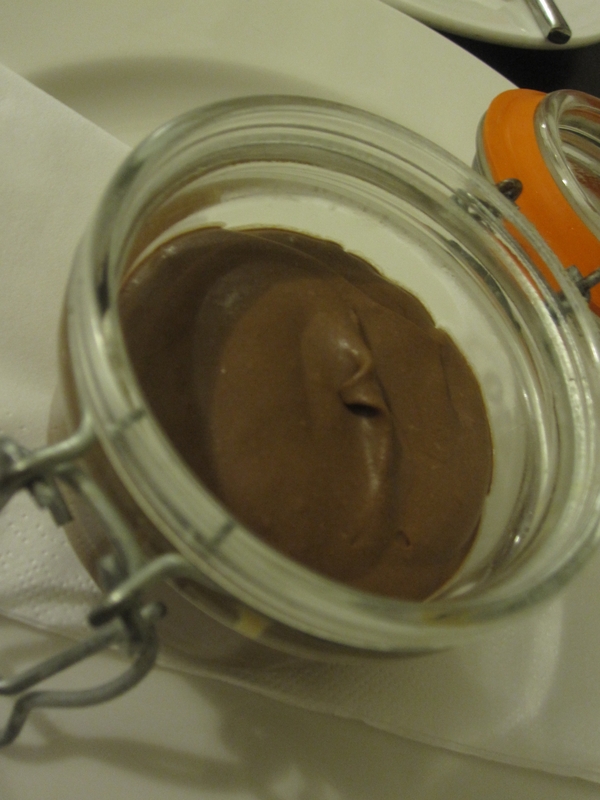 Try it, maybe make a batch for a little mothers day gift or for the next time you are going to a friends for dinner. A big hit at our first supper was the orange cured salmon dish, our fish course and the perfect antidote to the very rich parfait and duck either side of it. 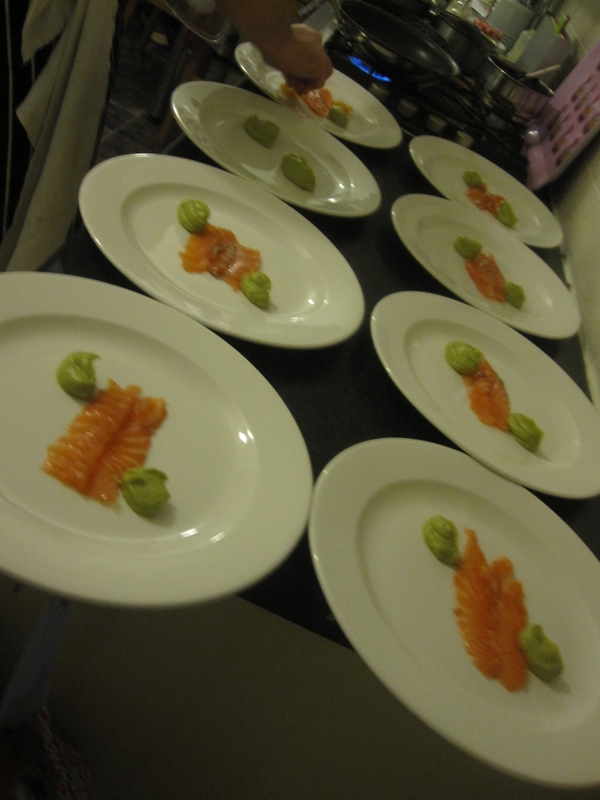 It is very easy to do yourself, and cured salmon is so good, so delicate. Try it at home. 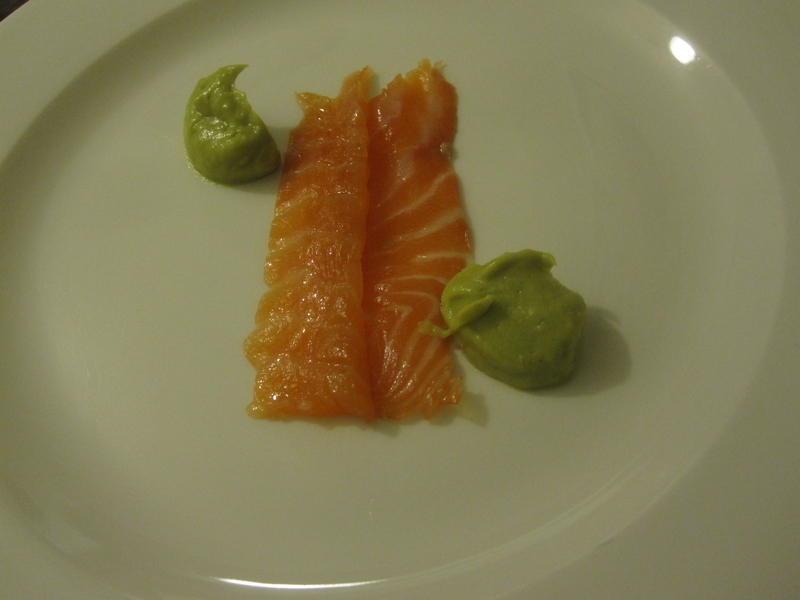 This recipe is for 225g of salmon, adjust if you want to make a whole side like us! Put your salmon in a tray and cover with the juice and sugar then cover the salmon with cling film and refrigerate overnight. 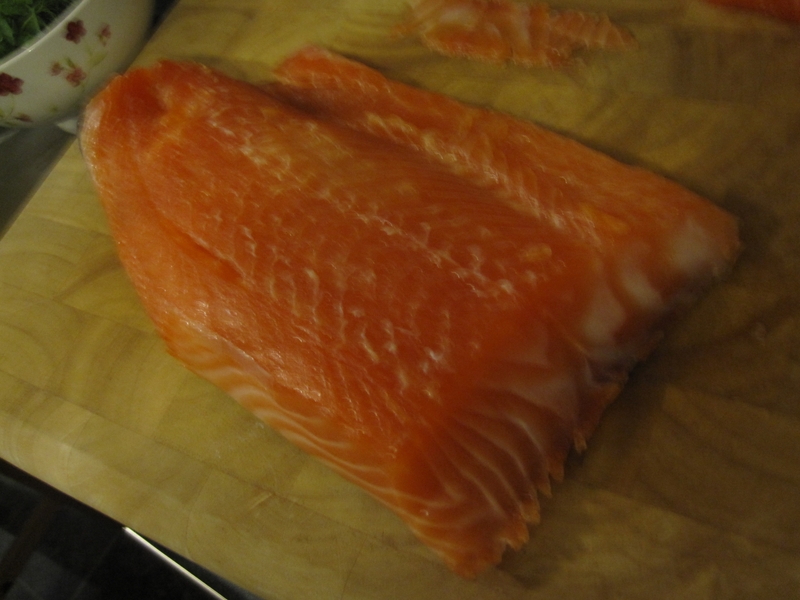 The next day, rinse the salt and juice off the salmon if done. It should feel slighty firm. Pop back in the fridge until your ready to slice and eat! So delicate and lovely to eat. 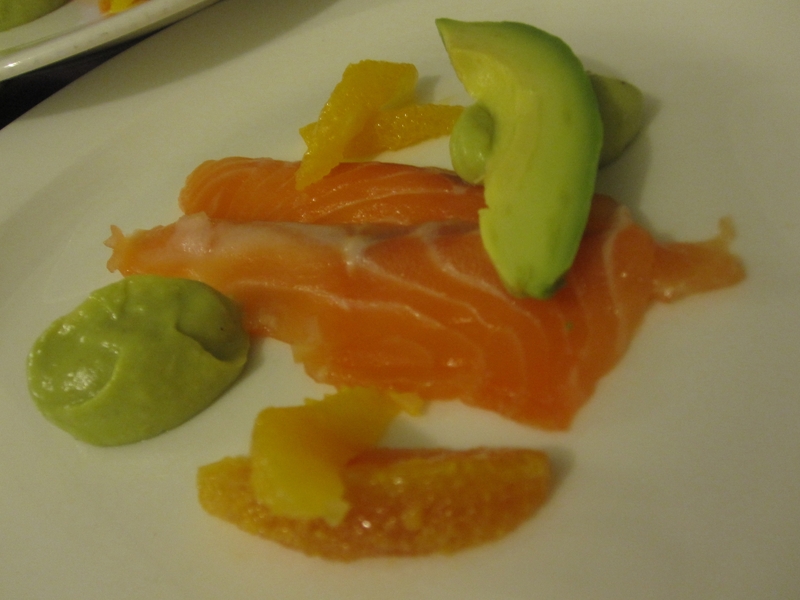 We served our with some puréed avocado, fennel and orange slices with an orange vinaigrette (try orange juice, sugar, olive oil, salt, adjust to taste) which was summer on a plate! I am definitely making this over the summer. A lot! 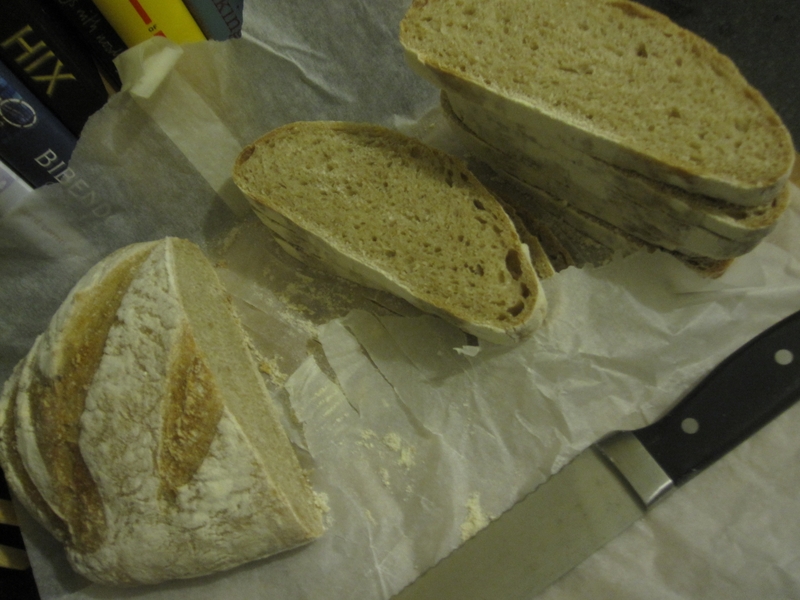 As I mentioned in my post yesterday, we were fortunate enough to be given homemade real bread for our first supper. I wanted to dedicate a post to this bread, partly because it was so good so to say thank you to John but also to talk about real bread. 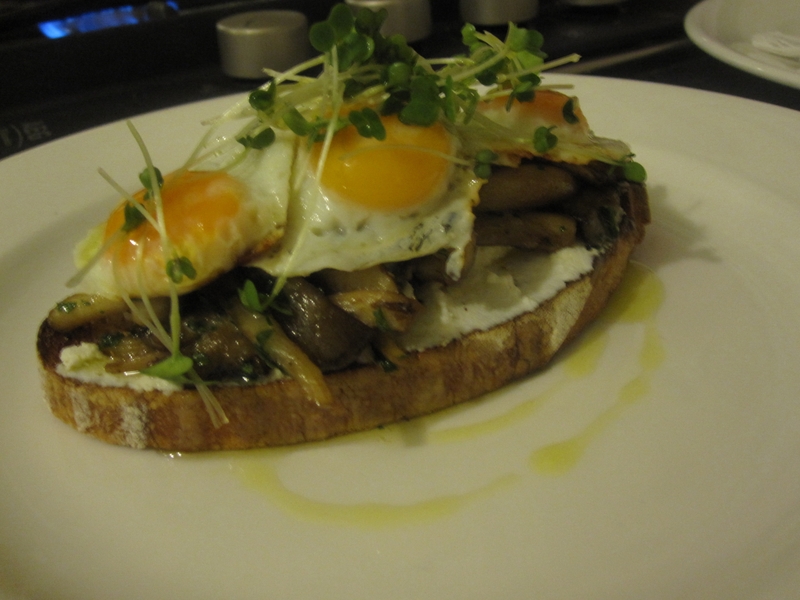 We used John’s sourdough to make toast to eat with the parfait and for the ricotta toast, mushroom and quail egg vegetarian starter. 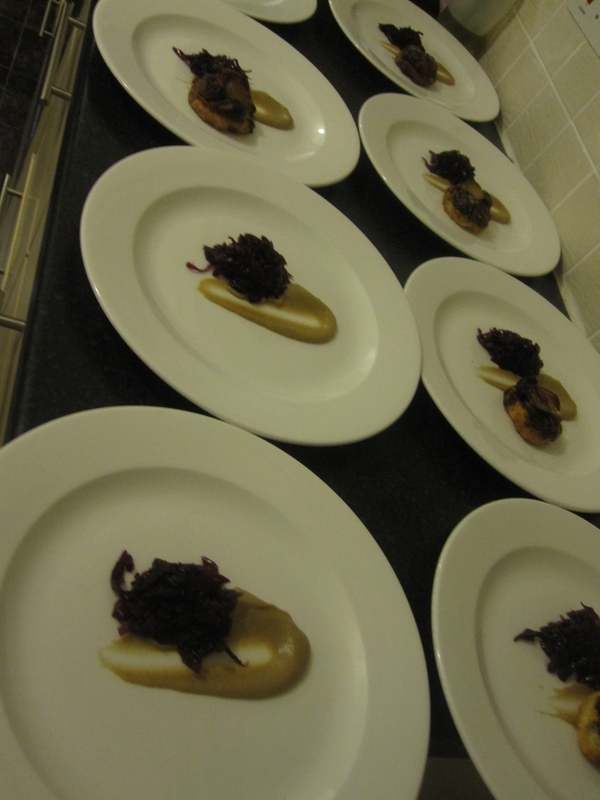 Meanwhile I munched some in the kitchen to keep me going serving all the lovely food, with a nice layer of butter. YUM! It is only really this year that I have really developed a passion for ‘real bread’ and I actually cannot go back to the bread I used to eat from the supermarket now. The difference I notice physically is that real bread is really fresh the day you get it and gets progressively harder. After the first couple of days it is purely bread for toasting. But this is not a bad thing, it just makes me wonder what the hell goes into the bread I would normally buy that never goes hard, just mouldy. 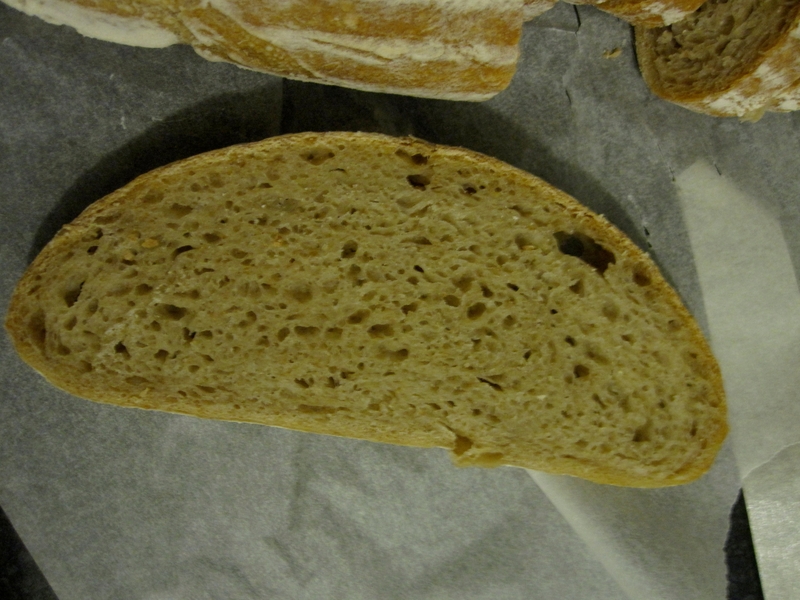 The biggest difference is in the taste, and how filling real bread is. You only need one slice with your eggs in the morning, any more and you’ll struggle to eat it all! I always try to get some at the weekend, and when I do hardly ever eat lunch. Just a proper breakfast and dinner. My local bakery is Mark’s Bread which I have mentioned many many times! They make about 10 different types of bread, plus croissants, Danish pastries and they have cakes too. They spent weeks perfecting their croissant, and really they could be French, again filling, real and fill you up. Sound like a croissant you can get in the supermarket? Nope! 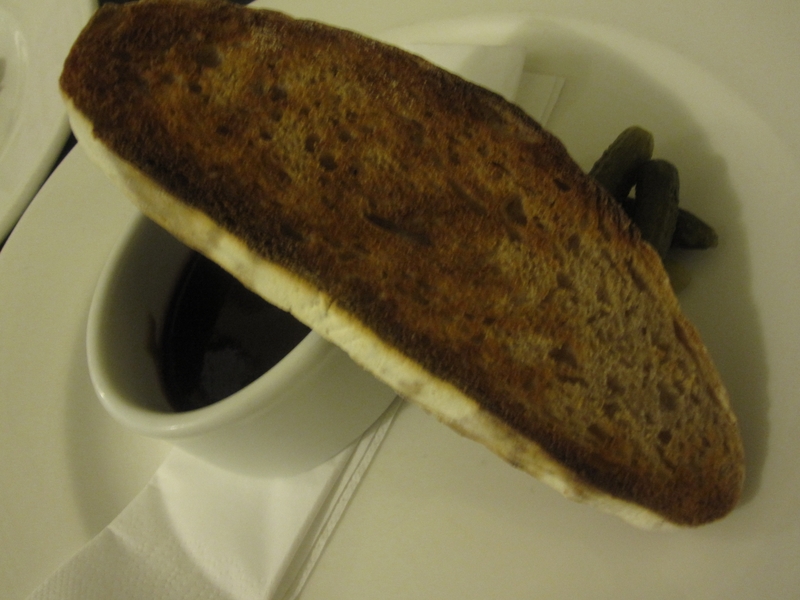 Others to note in and around Bristol are Harts Bakery in Cotham, The Bertinet Kitchen in Bath and Hobbs House in Chipping Sodbury (available all over Bristol, I get mine at the Sourdough Cafe in St Nicks Market. If you have more recommendations please let me know! Try real bread and you won’t go back, I cannot bear to eat the plastic bread anymore. 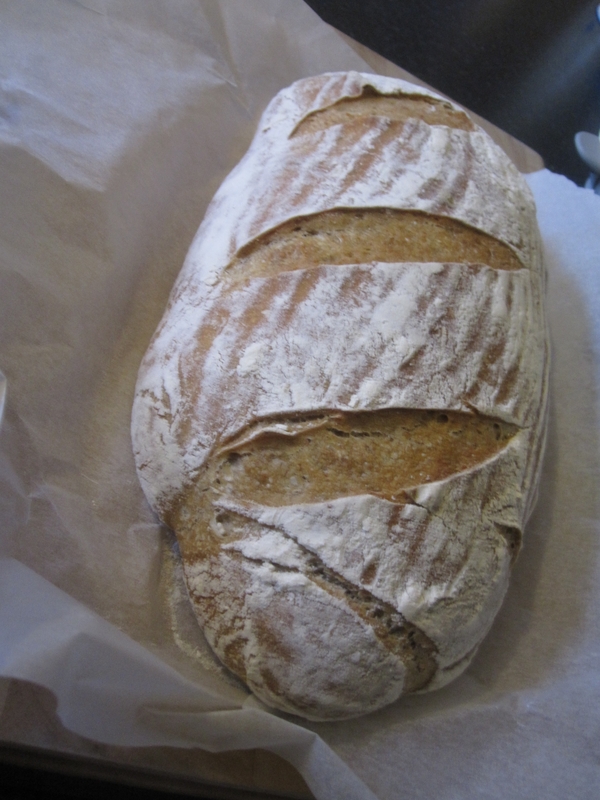 I will be going to Johns kitchen bakery very soon and making some bread with him, bread that we can all make at home. 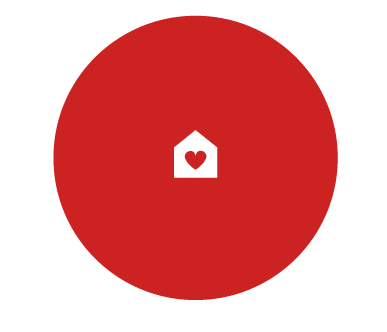 Very excited about that blog post! 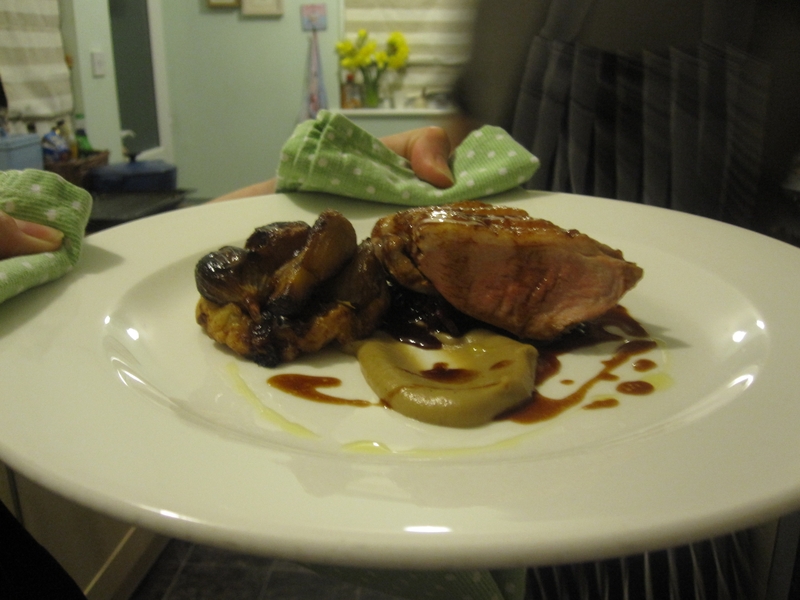 Tim of Moreish and I launched our Supper Club on Thursday and Friday, and it was brilliant. 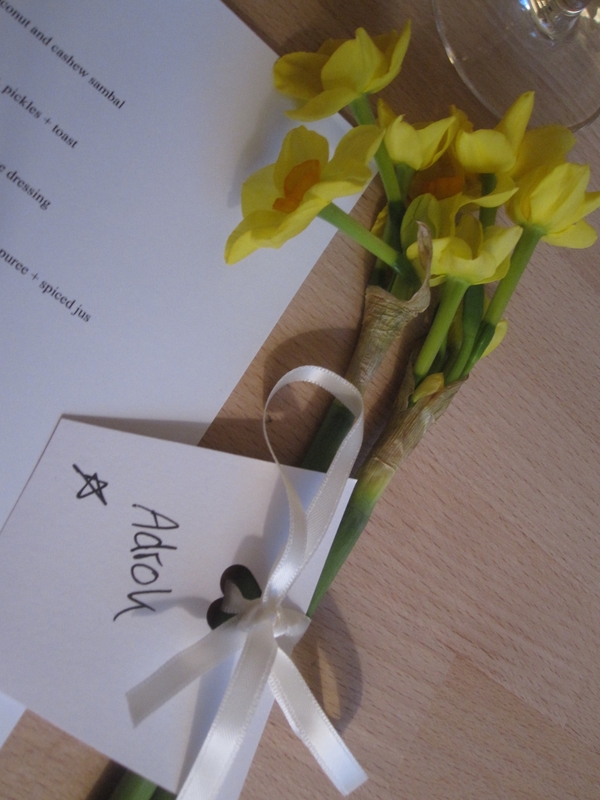 We had some lovely guests, the food was amazing (thanks Tim!) and I had lots of fun decorating the table, trying the food and hosting. 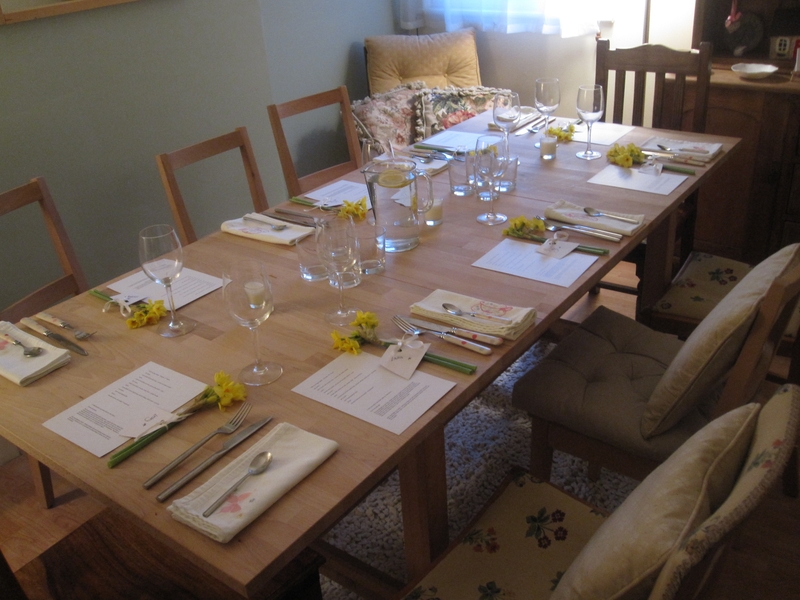 I love making a table look nice, and although I kept it simple I think it looks very spring like and pretty! 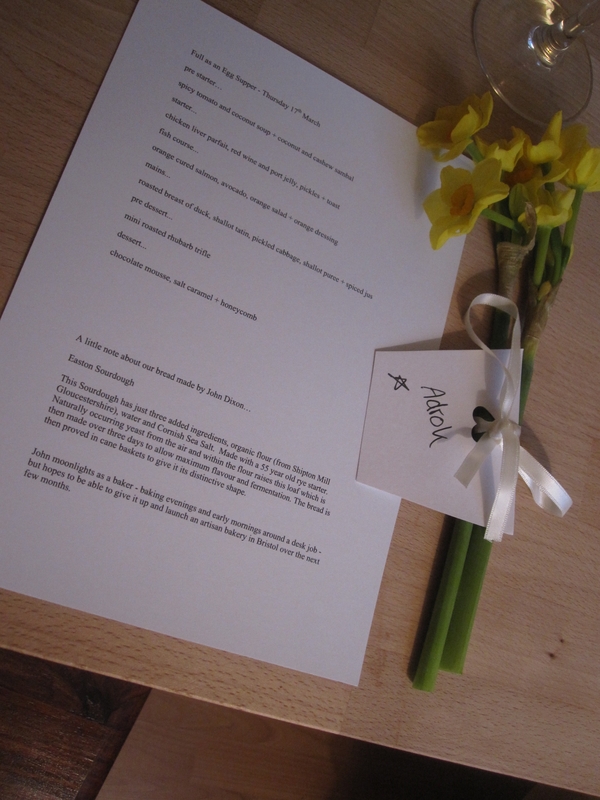 I printed out the menus on some nice card and gave everyone a flowery place setting. I cannot wait to do more! 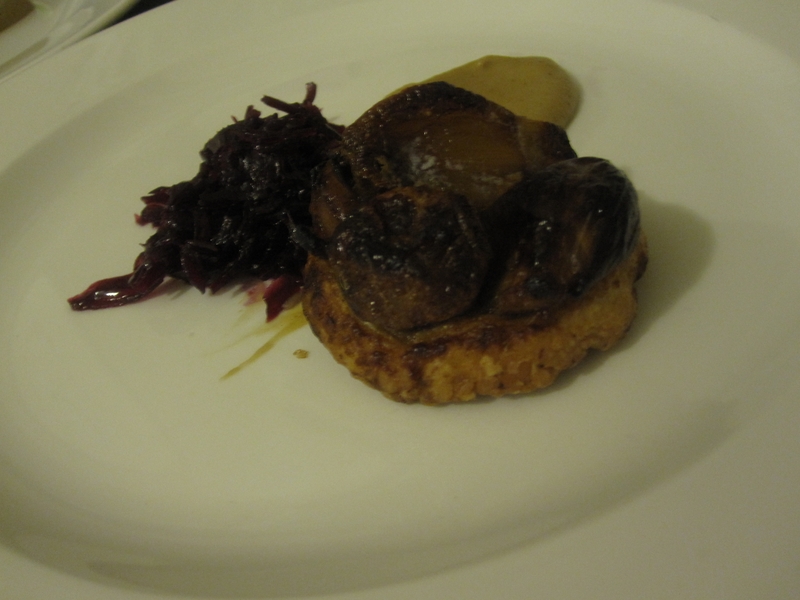 I thought I would share some photographs of the food and then talk about some of the food and how to make it at home if you want to in the blog over the next few weeks. 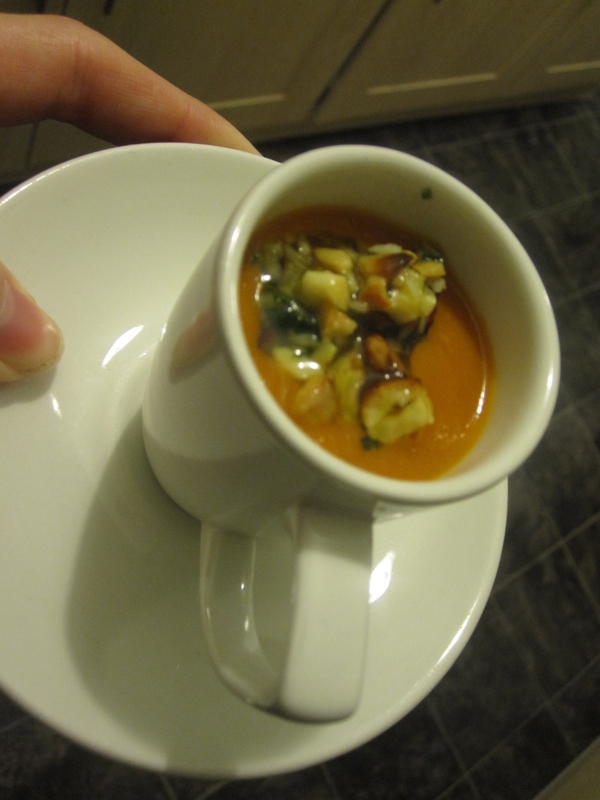 So we started with a pre starter of spicy tomato and coconut soup and coconut and cashew sambal which was quite sweet and perfect as a small appetizer. 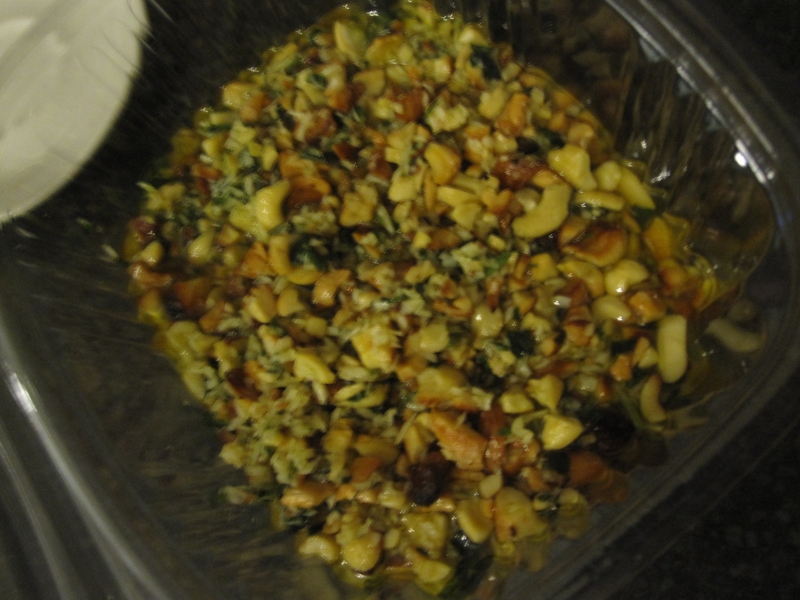 The sambal is the nutty mix on top, its cashews, coconut, herbs and seasoning… so good. 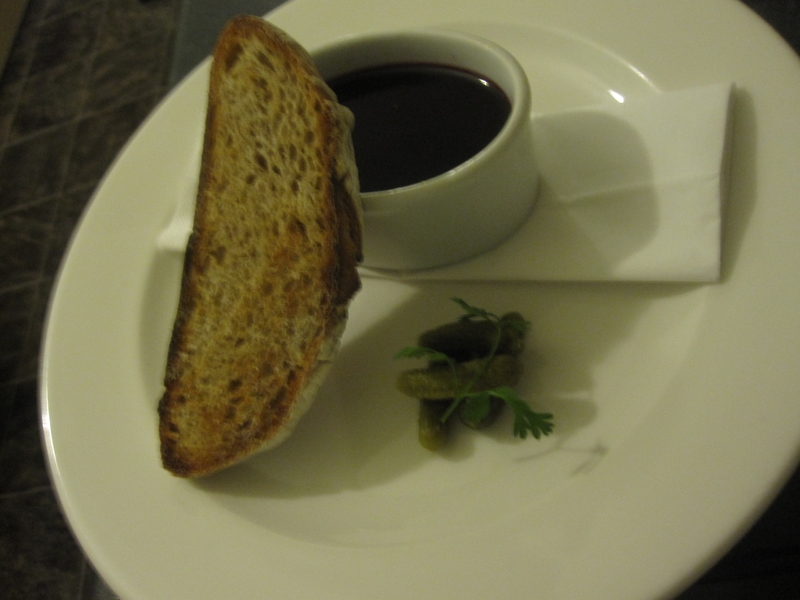 Then there was a starter of chicken liver parfait, red wine and port jelly, pickles and sourdough toast. 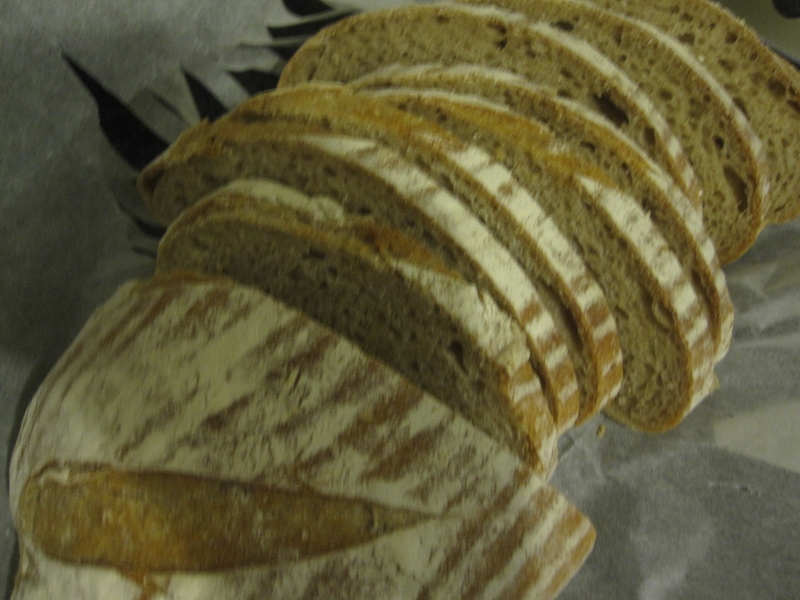 The bread was provided to us by John Dixon who is hoping to launch his own bakery soon, I will talk more about the bread in another blog coming very soon, it deserves a dedicated post! 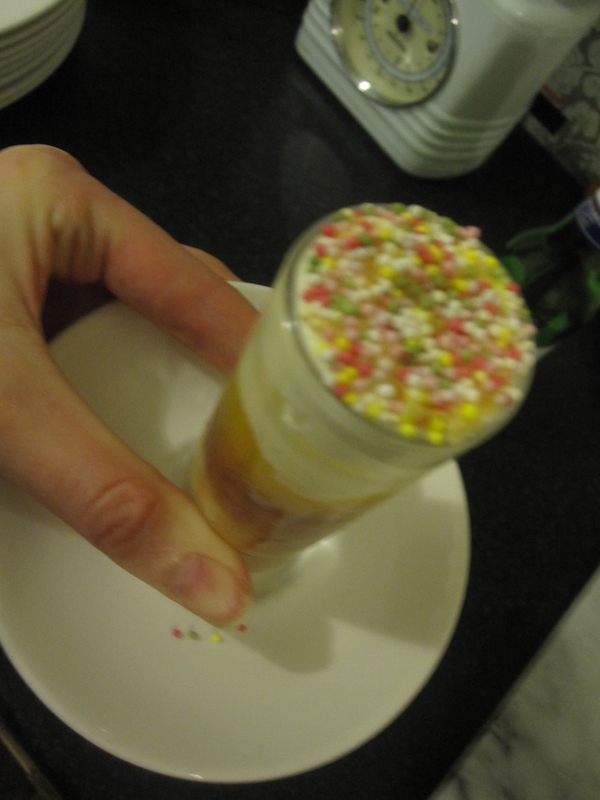 The parfait was so creamy, and the jelly on top was great cutting through the richness. 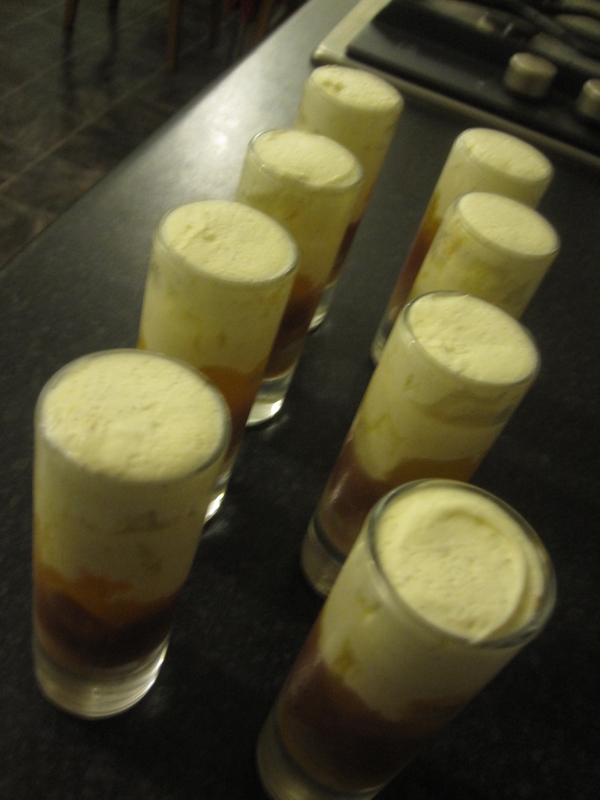 They were quite large but most people still managed to scoff the whole lot! 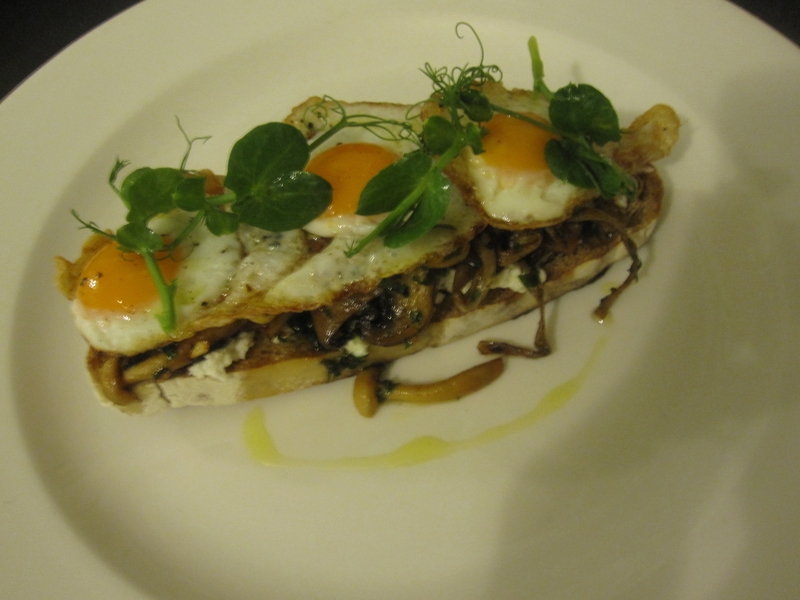 For the vegetarians we served wild mushrooms, fried quails egg on ricotta toast. This. was. beautiful. I so want to make this for breakfast. The fish course was a great palate cleanser after the rich parfait before the duck. 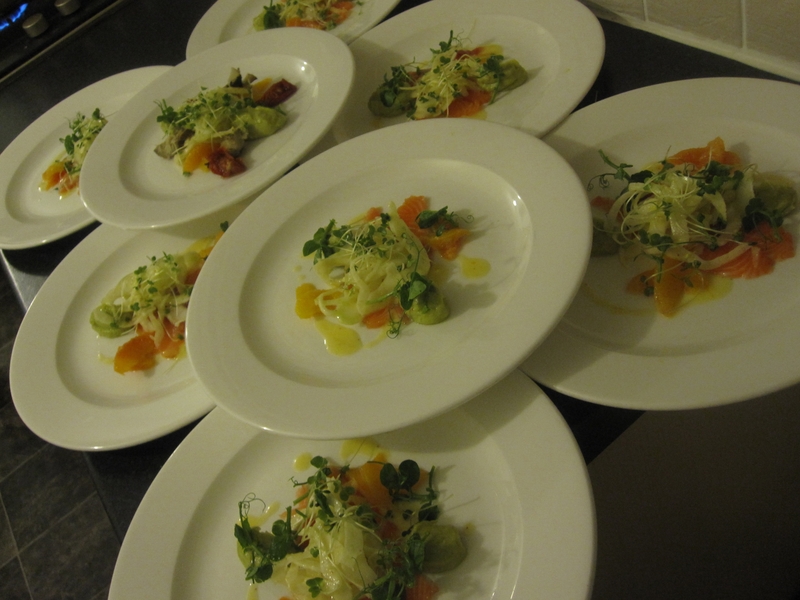 Everyone adored this course; orange cured salmon, avocado, orange salad + orange dressing. Originally Tim wanted to cure sea-trout but for some reason, although it is in season we couldn’t get any from anywhere. 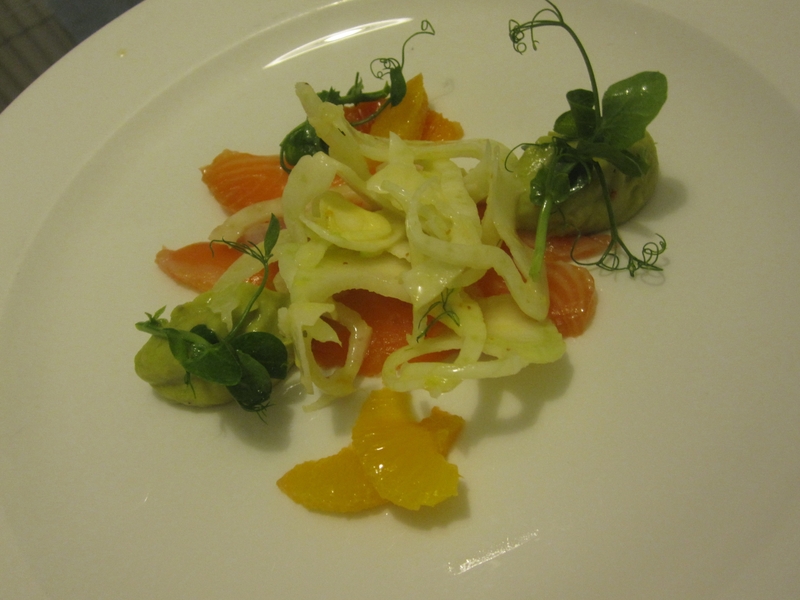 This was beautiful, the salmon was so delicate with the taste of orange coming through at the end. 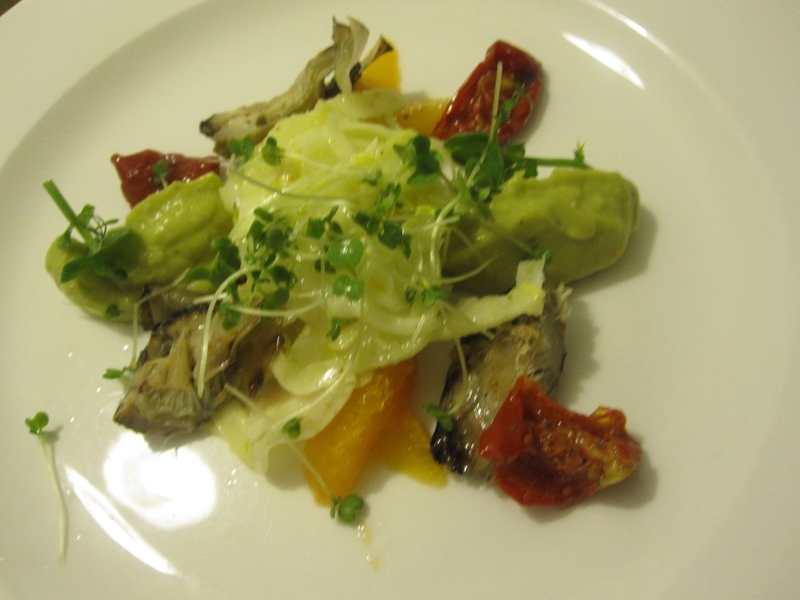 Together with the avocado, orange and fennel this was such a fresh dish, the kind of meal I want to live on this summer. Several people said it was their favourite course. 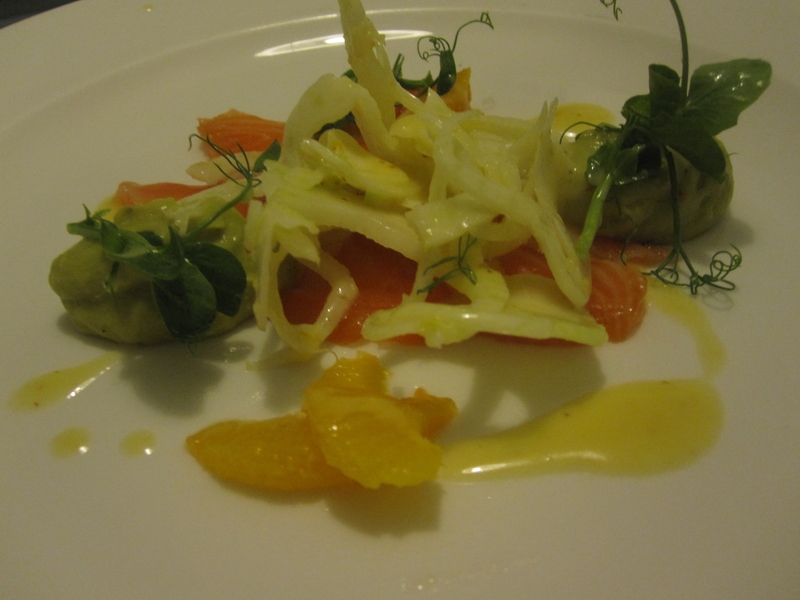 The vegetarians had a similar salad with artichokes and sun-dried tomatoes replacing the salmon. This was so tasty, Tim, Hannah (our helper) and I all made ourselves mini versions of the dinner rather than having nibbles. 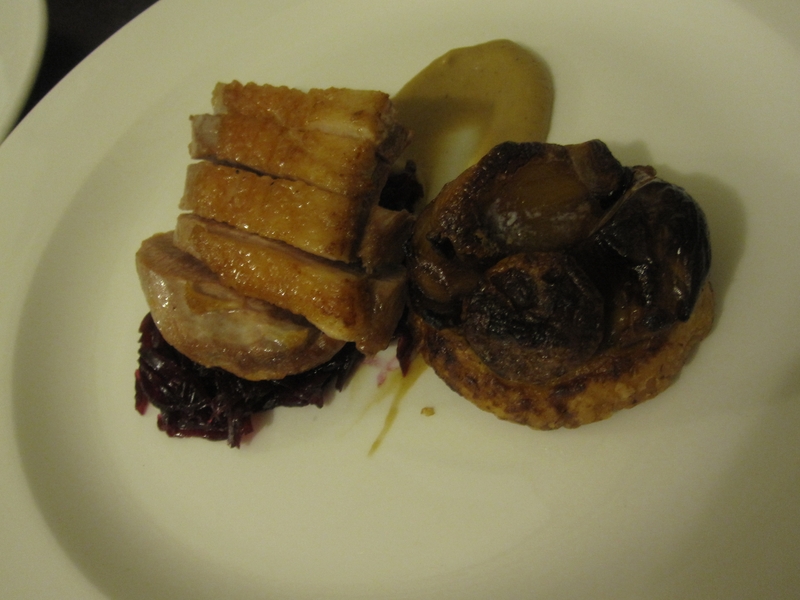 It all worked so well together, both nights this dish was a stand out favourite. 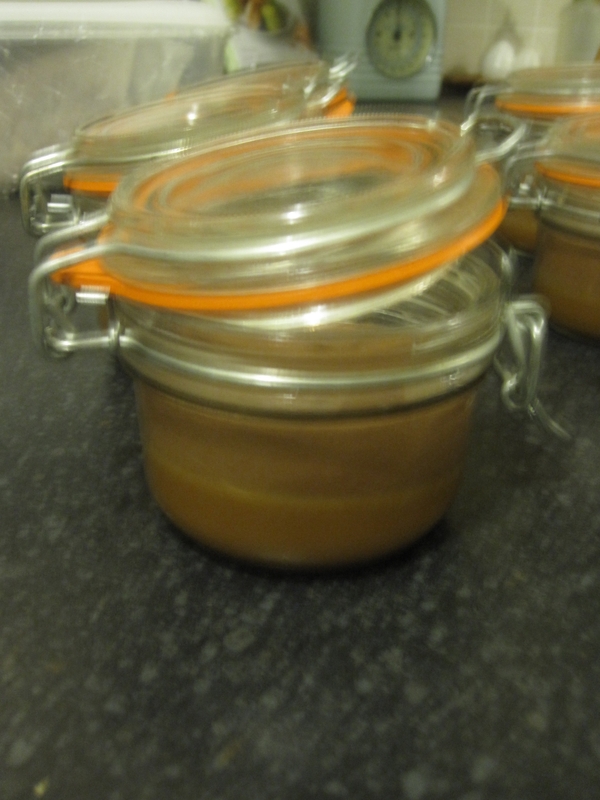 I do love a good puree, and this shallot puree was so good, we couldn’t stop eating it! 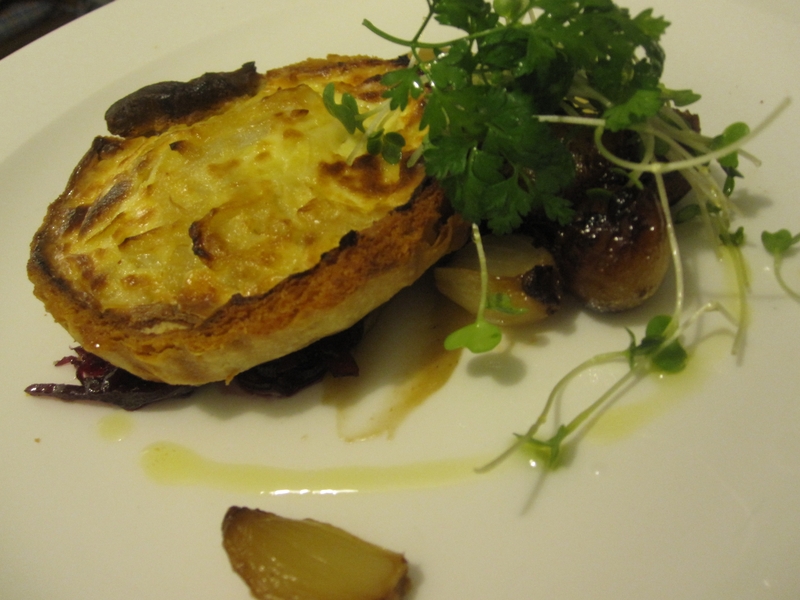 For the vegetarians, an onion and parmesan tart with roasted shallots and pickled cabbage. Then another palate cleanser before jumping in with the rich dessert. 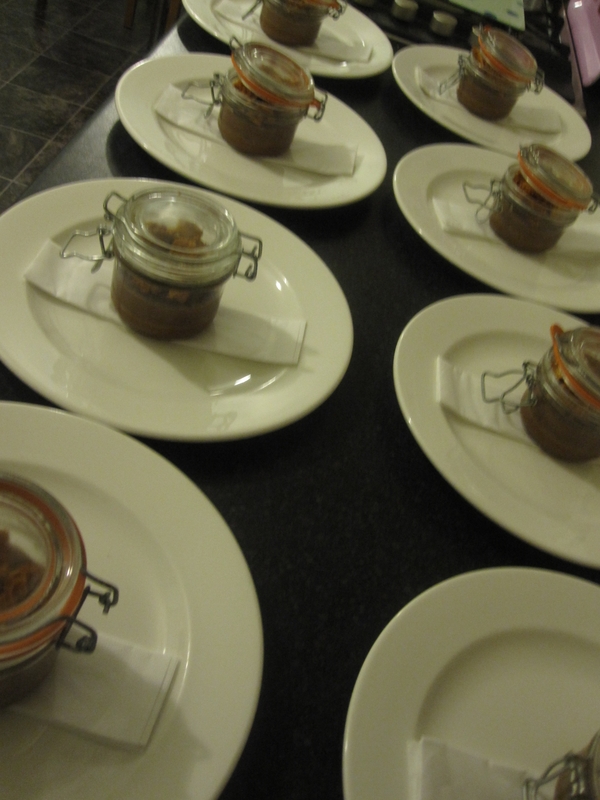 The dessert really finished people off, a layer of salt caramel, chocolate then honeycomb, it was big and so amazing. 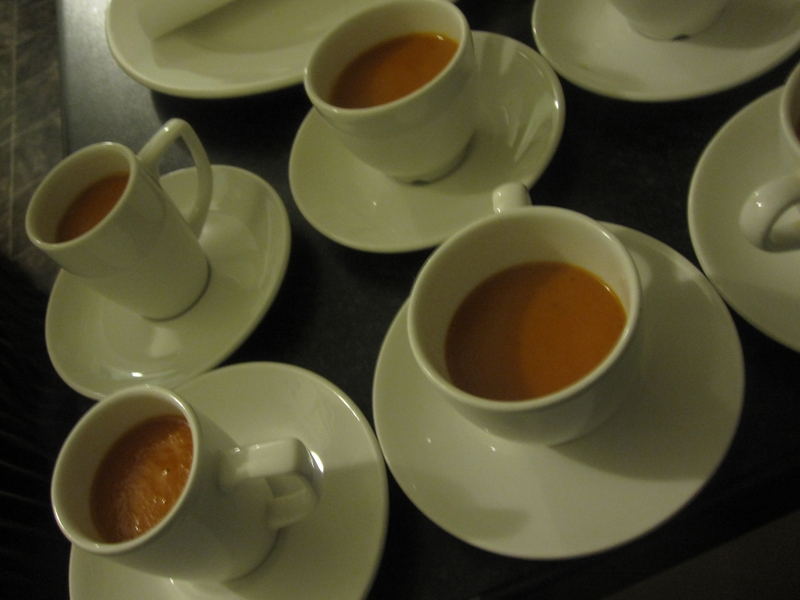 I really had a lovely time on both evenings, and although I planned on hosting and chatting a lot more, I actually couldn’t get a word in edgeways as the table seemed to be getting on so well both evenings that I left them to it. I will hopefully be announcing our next dates very soon so keep an eye on my Twitter @fullasanegg or email fullasaneggsuppers at gmail to join the mailing list and be the first to hear! There are some reviews of this night online too… check them out. Thanks again to everyone for coming, to Tim for cooking all of the amazing food and to our helper Hannah who made the whole evening stress free and so fun! 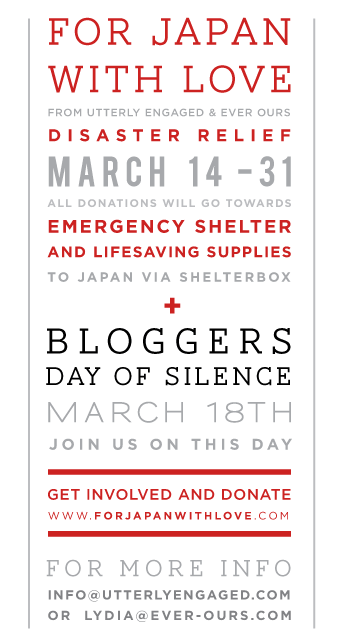 I will be joining in with the day of silence for Japan tomorrow and donating to the disaster relief fund. Please join me in thinking of those who are suffering something so great I can hardly comprehend it, and donate all that you can. So another post, linking to yet another blog. I do read a lot of different blogs. Eat Like a Girl is written by Niamh who is based in London and is a very accomplished blogger and chef, her blog is highly acclaimed and full of delicious recipes and comprehensive, very honest restaurant reviews. I love her recipes and although I am yet to cook many of them it is purely because I need to dedicate time to them. She has a book coming out soon, Comfort and Spice. I will definitely be buying this. They have a bit more detail than I am used to, and as you can see if you compare the below result with her fish cakes, I need to pay more attention next time, n my defense it was Friday, I had, had a couple of glasses of wine and I was exhausted. This makes 8 main size fishcakes. 1. You need to boil your potatoes, I always leave the skin on for those vitamins and because I like it but you can peel if you prefer. I can them to small chunks and boiled for 7-8 minutes. 2. Simmer the milk, add the bay leaves and the fish, lying flat if you can, making sure it is covered by the milk. Do not burn the milk, watch that temperature. This should pouch in about 10-15 minutes. 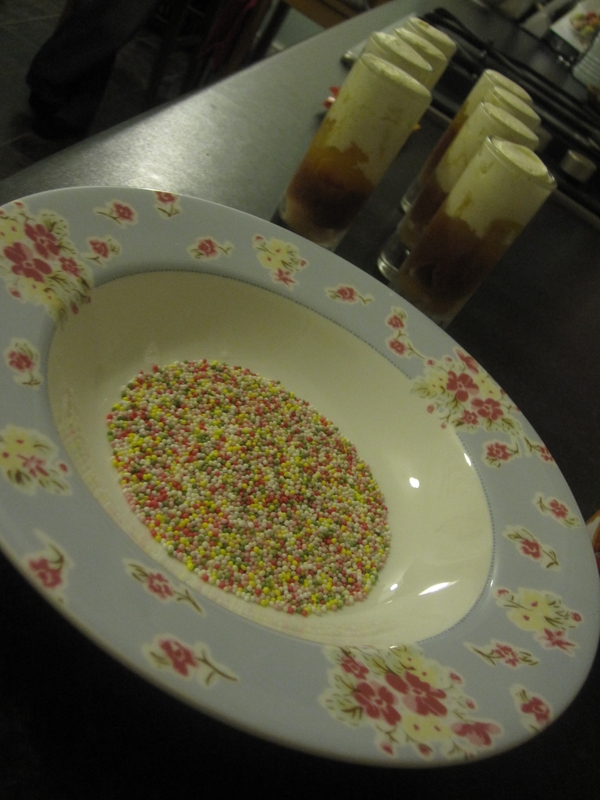 When its finished, drain keeping the milk and flake the fish into the mash. 3. To your mashed potatoes add the parsley, butter and spring onions. You can use with the poaching milk here if your mash needs it. Season and mix it up! 4. Shape into the size you can and fry in a hot pan with some olive oil to get a nice crispy skin on them. I have no doubt if I had gone the extra mile and used Niamh’s full recipe they would have been even better, but I didn’t have any bread, and I forgot the onion… like I said it was Friday, it was late and I was tipsy! 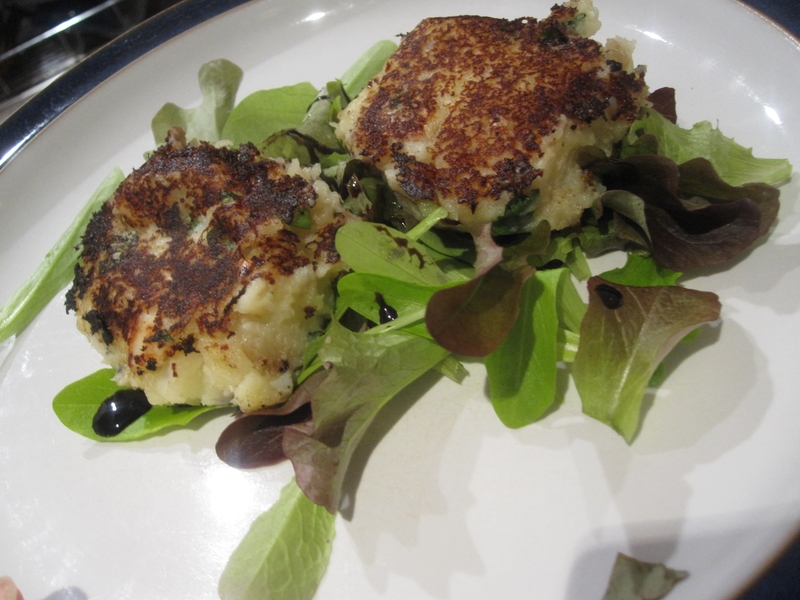 So give my cheater version a go if you want something quick and super easy, but Niamh’s requires a little more effort for what I imagine is a better fish cake. I will try again soon, and make sure I have everything I need!